Maria Lütje joined Change Group in 2005 as an Executive Coach. She earned her degree in Physics and postgraduate studies in Information Technology, followed by continuing education in Marketing and Sales. She now specializes in marketing for the IT and telecommunications industries. Maria Lütje knows virtually everything about top management in corporate groups. Before joining Change Group as a coach, Maria Lütje worked as Business Development Manager at T-Systems, a division of Deutsche Telekom. Within this management position, her second focus was on strategy development. She started her career as a product manager for Nixdorf Computer AG. 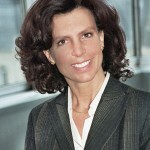 Later, she led large-scale national and international R&D projects for a subsidiary of Deutsche Telekom. Her subsequent focus was on developing new fields of expertise in “system solutions” and in staffing and managing appropriately trained teams. In the process, she grew into a role as a mentor for young executives. Maria Lütje completed a one-year training program in ISP (integrated solution-oriented psychology), autonomy training and systemic solution-oriented therapy. You can’t tempt Maria Lütje with coffee. She prefers a good Darjeeling with a hint of sugar.